I just finished the biography of Dietrich Bonhoeffer by Eric Metaxas. The subtitle is Pastor, Martyr, Prophet, Spy, and Mextaxas does a nice job developing each of these four dimensions of who Bonhoeffer was in facing the rise and reign of Hitler during WWII. What reviewers are saying is that Metaxas presents another side to Bonhoeffer – the more conservative side – that has sometimes been lost to liberal theologians who have tried to claim him as their own. The book is well-written and comprehensive in its scope. 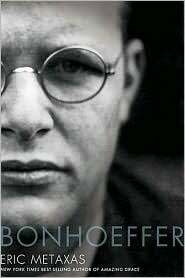 It presents another side of Bonhoeffer and provides a context for many of the decisions he faced. It provides a lesson not only in obedience to God but also in the prophetic role of the church as a community of faith. I’m just finished “Life Together” and “The Cost of Discipleship”. I wouldn’t say Bonhoffer is “fun” to read but his desperate and forceful prose raises and answers hard questions about a faith walk in the face of persecution unto death. It’s somewhat disturbing and liberating at the same time. It was interesting to read his biography to get a sense for the context in which he wrote those classic books. You might find that particularly interesting now that you just finished them.